'If we don't capture them, they will die anyway.' Scientists are desperate following the latest news regarding the world's smallest porpoise. The already desperate situation for the world's smallest porpoise, the vaquita, is getting even worse as the number of animals off Mexico's shores continues to plummet. Now, scientists warn that only 30 animals are left, despite navy efforts to intercept fishing vessels illegally using gillnets. Gillnets are one of the main factors threatening the vaquita. "At the current rate of loss, the vaquita will likely decline to extinction by 2022, unless the current gillnet ban is maintained and effectively enforced," says the International Committee for the Recovery of the Vaquita (CIRVA). The scientists concluded that just 30 individuals remain after analyzing acoustic signals from the upper Gulf of California in northwestern Mexico. In a previous census at the end of 2015 they had found around 60 vaquitas. There were 200 of them in 2012 and 100 in 2014. The scientists have announced what could be a last-ditch effort to save the rare species by capturing specimens and putting them in an enclosure in the Gulf of California, allowing them an opportunity to reproduce. Some environmentalists oppose this approach and point to the risk of vaquitas dying in the process, as DW has previously reported. But authorities and other environmentalists say the vaquitas have been dying for years in gillnets that are meant to illegally catch another endangered species, a large fish called the totoaba . The totoaba's dried swim bladder is often shipped to China, where it fetches tens of thousands of dollars and is eaten in soup. CIRVA member Lorenzo Rojas-Bracho told AFP that scientists would attempt to catch vaquitas around October. "Illegal fishing continues and if we don't capture them, they will die anyway," he said. Saving the vaquita by catching them? More than a dozen US states filed a joint lawsuit arguing that President Donald Trump's national emergency is unconstitutional. The suit stresses that it is Congress who has the authority on funding matters. Police used tear gas to stop hundreds of migrants attempting to rush the border fence to claim asylum in the US. Mexican authorities are to deport migrants accused of trying "violently" to cross the border. 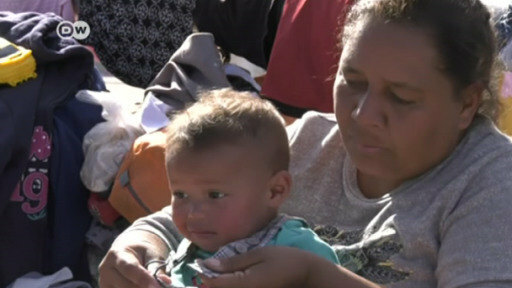 Thousands of Central American migrants have begun arriving in Tijuana, the border town separating Mexico from the US state of California and thus the last stop before they enter the US. Resources are limited and some locals are less than friendly.